Also known as Lee's lines, or X-line method. A radiogical measurement to diagnose traumatic atlantooccipital dislocation. In this method, two lines were drawn. The first line connects the basion to the midpoint on the C2 spinolaminar line (the anterior aspect of the posterior ring of C2) (B-C2SL). The second line connects the opisthion to the posteroinferior edge of the body of C2 (OC2). The first line (B-C2SL) should pass across the superior posterior aspect of the dens (tangentially intersecting it). 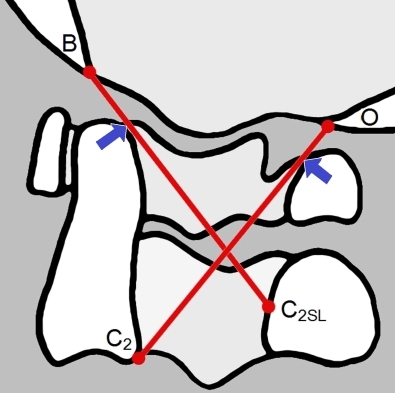 The second line (OC2) should pass just anterior to the posterior ring of C1 (tangentially intersecting the highest edge of the C1 spinolaminar line). Atlantooccipital dislocation is diagnosed if both lines are displaced. Lee C, Woodring JH, Goldstein SJ, Daniel TL, Young AB, Tibbs PA. Evaluation of traumatic atlantooccipital dislocations. AJNR Am J Neuroradiol. 1987 Jan-Feb;8(1):19-26.